Provides the state of the art of modelling, simulation and calculation methods for electromagnetic fields and waves and their application. Illustrations note XII, 334 p.
This monograph contains the ceremonials and proceedings of the Workshop/Minisymposium on "Electromagnetics in a Complex World: Challenges and Perspectives," convened at the University of Sannio, Benevento, Italy from February 20-21, 2003, in connection with the bestowal of an honorary Laurea degree on Professor Leopold B. Felsen. 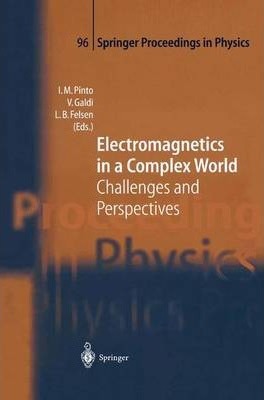 The various contributions from scientists and engineers in academy and industry address diverse problems in electromagnetics, either on a broad scale or in particular specialties. The wide-ranging topics and techniques, analytic models (with phenomenologies) and numerical simulations - motivated by actual or potential applications to real-world problems - are intended to stimulate interdisciplinary exchange. Long Live Italia.- I Generics.- and Overview.- Exterior Differential Forms in Teaching Electromagnetics.- Education to the Environmental Impact of Cellular Technology: A Correct Understanding and Dissemination Approach.- II Hybrid Techniques for Electromagnetic Propagation and Simulation.- Challenging Electromagnetic Problems and Numerical Simulation Approaches.- Wave Propagation in Guiding Environments: Modeling, Simulation, Software Calibration and Canonical Tests.- Electromagnetic Field Estimation in a Complex Urban Environment.- Challenges in Automotive Electromagnetic Compatibility Modeling and Simulation.- High-Frequency Green's Function for an Infinite Periodic Line Array of Phased Electric Dipoles on an Infinite Stratified Grounded Dielectric Slab.- Multiscale Analysis of Large Complex Arrays.- Reference-Wave Solutions for the High-Frequency Fields in Random Media.- Electromagnetic Field Computations with the Generalized Network Formulation (GNF).- III Nonconventional Modeling.- Toward a Full-Wave-Based Electromagnetics Approach to Chaotic Footprints in a Complex Deterministic Environment: A Test Model With Coupled Floquet-Type and Ducted-Type Mode Characteristics.- Electromagnetic Diffraction from Fractally Corrugated Surfaces in Uniform Translating Motion: An Exact Rel ativistic Solution.- Tip Singularity of the Electromagnetic Field at the Apex of a Material Cone.- Diffraction by a Dielectric Wedge by Use of the Dual Integral Equations (Abstract only).- Challenges and Perspectives of Complex Spaces and Complex Signal Theory Analysis in Electromagnetics: First Steps.- Complex Point Source Approximation of Gaussian Beams in High Frequency Scattering.- Leakage Phenomena in Planar Arrays.- Stochastic Surface Models for Electromagnetic Scattering.- Uniform Double Diffraction Coefficient for a Pair Wedges in Arbitrary Configuration.- IV Ultrawideband Techniques.- Electromagnetic Characterization of Ultra Wideband Antennas.- Time-Domain Modes - Asymptotic Expansion and Error Estimates.- A Combined Floquet-Wave - FDTD Algorithm for the Modeling of Transient Radiation from Infinite Periodic Structures.- Toward a Network-Oriented Theory for Sequentially Pulse-Excited Periodic Arrays: Background and Current Status.- V Inverse Modeling.- Wavefield Inversion in Nondestructive Testing.- Embedding Approach to Modeling the Electromagnetic Behavior of Simple Objects in a Complex Environment (Abstract only).- Local Domain Modelling of High Contrast Scattering.- VI Degree Award Ceremonials.- Laudatio on Professor Leopold B. Felsen.- Lectio Magistralis.- Citation.- Photo Gallery.